One cannot pierce the heart of the Muslim Brotherhood Mafia, and its infiltration/penetration into America, sans a KEY requisite knowledge base. Thus, CAIR’s (Council on American-Islamic Relations, a most innocuous sounding name…used as bait to reel unsuspecting Americans into their web) deceptive veil must be ripped off, hence, unmasked. NO time to lose! For a quick primer, please peer within this blogger’s recent interview: The Muslim Brotherhood’s Quest For Global Dominance – An Interview With Adina Kutnicki. It is incumbent upon Americans/westerners to recognize and internalize their modus operandi, regardless of their Allah-wash, and those who jive talk alongside them. Don’t dare be fooled, for the unvarnished facts attest to out-sized dangers, both for America and the west in toto. IF CAIR, the Muslim Brotherhood Mafia’s mouthpiece, its propaganda arm, has a historical parallel, look to communist models of dissemination and deception. Communist regimes could not survive without them, nor could Nazi socialism – Pravda-like. It is also a well known secret, Barack HUSSEIN Obama is deeply, incontestably aligned with the Brotherhood, so much so that his White House is its revolving door. No exaggeration. And with each passing day, the romance between Obama Inc. and the Brotherhood Mafia swells and tightens. Ties that bind. Open sesame. Nevertheless, the Brothers have a knife at the POTUS’s throat, and this is an incontrovertible disaster for American interests. Moreover, the fact that the FBI is subservient to their dictates, well this too is, tragically, hardly shocking. On a day when the Council on American-Relations (CAIR) issued a report accusing its critics of bigotry, a Justice Department investigation reminds the public why CAIR does not merit the public’s trust. 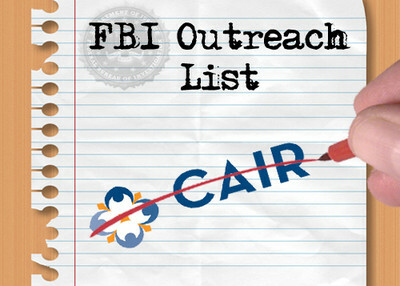 Inspector General Michael Horowitz found a series of incidents in which FBI field offices knowingly engaged in outreach activity with CAIR despite a 2008 policy banning non-investigative cooperation with the Islamist group. Only a summaryof the report has been released publicly. The rest is considered classified, but has been made available to Congress. Internal documents seized by the FBI show that CAIR and its founders, Omar Ahmadand Nihad Awad, were a part of that network known as the Palestine Committee. Both men appear on a telephone list of Palestine Committee members (Awad is listed under a pseudonym “Omar Yehya), and CAIR is listed on a meeting agenda listing the committee’s branches. But several FBI field office agents-in-charge balked at the policy, the Inspector General’s report finds, and the FBI’s Office of Public Affairs repeatedly offered field offices conflicting information. Despite a series of electronic communications explaining the CAIR ban – it does not apply to criminal investigations or civil rights complaints – issued from August-December 2008, and despite a mandatory meeting for Special Agents in Charge (SAC) of field offices, the head of the Los Angeles FBI office told his agents to ignore FBI headquarters. Wolf is chairman of the House Appropriations Committee’s subcommittee responsible for the FBI’s budget. He noted that the investigation only focused on incidents involving three field offices – Chicago, Philadelphia and New Haven, Conn., so the depth of the problem still is not known. That’s what happened in New Haven, the report finds. As the IPT reported in 2011, officials in the field office helped organize a community outreach program knowing that two local CAIR officials were involved. Rather than hold to the FBI policy, they agreed to conceal their role in organizing the event. In addition, the Inspector General found, the Office of Public Affairs advised the field office that the interaction was okay. “No,” said a written reply from Holder. In addition to avoiding interaction with a bad actor, the ban on CAIR contact is meant to prevent the group from touting its connections with law enforcement as a way to enhance its image. That’s exactly what happened in Philadelphia in 2010, the Inspector General’s report found. A local CAIR official was invited to an FBI “Citizen’s Academy” program despite the FBI policy’s specific reference to the program as off-limits to CAIR representatives. While it boasted about FBI contact in this case, CAIR officials more often disseminatea message of fear to Muslim Americans, portraying FBI agents as ruthless and corrupt – willing to do anything to set up innocent Muslims. One CAIR chapter urged Muslims to “Build a Wall of Resistance” from the FBI and not cooperate in criminal investigations. The policy did not come out of the blue. Awad, picked up on FBI recordings of Palestine Committee meetings, remains CAIR’s executive director. He has never acknowledged his relationship with the Hamas-support network, and therefore, never disavowed it. In a 2003 deposition, he claimed not to remember whether he attended a weekend-long Palestine Committee meeting in Philadelphia called to discuss ways to “derail” American peacemaking efforts between Israel and the Palestinians. The group also talked at length about how to deceive Americans by hiding their Hamas support. Those are among the things that make the FBI question “whether there continues to be a connection between CAIR or its executives and HAMAS” and bar interaction between its agents and the group. Perhaps the Inspector General’s report will prompt field office officials to stop ignoring their own leaders and the information gathered by their fellow agents. Most significantly, as mentioned in the above linked interview, a well known rabid Islamist, Mohamed Elibiary, burrowed deeply inside Washington’s counter terror ! centers, just got promoted into a top spot at DHS, his Islamic terror ties beside the point. Beyond indicting of Obama Inc. Need more re Obama Inc.’s new Islamic appointment? Well and good. Senior Homeland Security Advisor: America is an “Islamic Country” Mohamed Elibiary, a senior Dept. of Homeland Security advisor, tweeted that America is “an Islamic country.” America is (almost) burnt toast! For the visual and audio-inclined, the following is presented by a close contact and it will whet your appetites. A fellow ‘hunter and digger’ delivers the goods: Tom Trento, aka the terror hunter, via his tv show, parallels CAIR to a criminal syndicate, tying in their nexus to the jihadi terror at Kenya’s shopping mall ! Additionally, CAIR is caught dead to rights, fully detailed within the following video link – http://www.youtube.com/watch?v=JzmHw6rptfE. Again, this blog’s clarion call – re the symbiotic relationship between U.S. intelligence/counter terror forces and CAIR, both from past and present administrations, ratcheted up under the Islamist-in-Chief’s watch – (dis)graced these pages, yet most prefer to close their eyes. It will (soon) come a time when blindness is no longer viable. Do you need a visual aid to bring the thesis full circle? Fine. RESOLVED, Obama is behind the Muslim Brotherhood Caliphate conspiracy ! Therefore, every so often (like a broken clock) it is incumbent upon this American-Israeli to offer, anew, lessons in this arena. In fact, for those who are acquainted herein, remedial ones can be helpful too. For the record, one cannot know too much about their plans. Besides, like chameleons, they keep evolving/mutating into the deepest recesses of America. Like cockroaches. Vermin.Therefore, we must keep abreast….every step of the way! This entry was posted in Uncategorized and tagged A fellow 'hunter and digger' delivers the goods: Tom Trento, Barack HUSSEIN Obama is deeply incontestably aligned with the Brotherhood, CAIR, CAIR's, has a historical parallel, he symbiotic relationship between U.S. intelligence/counter terror forces and CAIR, his tv show, its propaganda arm, jihadi terror at Kenya's shopping mall, rabid Islamist Mohamed Elibiary burrowed deeply inside Washington's counter terror ! centers, RESOLVED Obama is behind the Muslim Brotherhood Caliphate conspiracy, the Brothers have a knife at the POTUS's throat, the Muslim Brotherhood Mafia's mouthpiece, The Muslim Brotherhood’s Quest For Global Dominance – An Interview With Adina Kutnicki, Wolf Demands FBI Punish Agents For CAIR Contact by Adina Kutnicki. Bookmark the permalink. Adina, could you please give me more information on Mohammad Elibiary, head of the advisory council for Homeland Security? No discussion about him in American papers. Thank you for all you do to inform us of the truth. Additional details on him (from relevant contacts) attest to the same. I highlighted what was most intrinsic in the above interview. Adina, you need to be in the White House sitting on President Trump’s right side. Once he gets his staff up and running you would an irreplaceable resource. If you could only hook up with Ivanka or Jared. President Trump & AG Sessoms will rip the Muslim Brotherhood out of the USA by the roots. They will need all the expert advice they can get. katzinker, thanks for your high vote of confidence! On the other hand, the bull’s- eye would be that much greater. As an interesting side note, though Jared is his “elder”, my son went to the same high school as he did, sort of like, six degrees of separation!